Obituary* 17 Mar 2015� The Rev. Alta Marie Culpepper, 83 years, 11 months and 22 days, of Mt. Vernon, died 1:25 p.m. Saturday, March 14, 2015, at her home in Mt. Vernon. She was born Friday, March 20, 1931, in Marion, Ind., the daughter of Richard Henderson and Lillie Leona (McCain) Culpepper. The Rev. Culpepper was a pastor at a church in Wapakoneta, Ohio, Assembly of God in Chillicothe and First Assembly of God in McLeansboro. She was a radio program evangelist for W.M.C.L. in McLeansboro, W.G.G.H. in Marion and another in Sturgis, Mich. Alta traveled as an evangelist along with Irene Gourlas for at least 10 years in revivals and kids crusades. She owned and operated Words of Life Book Store in Mt. Vernon. She is survived by brother, John Thomas Culpepper of McLeansboro; and several nieces, nephews, great-nieces, great-nephews, great-great-nieces and great-great-nephews. She was preceded in death by her parents; one brother, Richard L. Culpepper; and two sisters-in-law, Ruth Culpepper and Mary Culpepper. Funeral service will be held at 10 a.m. Thursday at Hughey Funeral Home in Mt. Vernon with the Rev. Blake Clayton officiating. Interment will be at Oddfellows Cemetery in McLeansboro. Visitation will be held from 5 to 8 p.m. Wednesday at Hughey Funeral Home in Mt. Vernon. For those who wish, memorials may be given to the American Heart Association and will be accepted at the funeral home or mailed to Hughey Funeral Home, P.O. Box 721, Mt. Vernon, IL 62864. Obituary of Alta Culpepper, Mt. Vernon Register News, 17 Mar 2015. E-mail written Sep 2006 to Warren Culpepper from Sandy Shouse Withiem (gd of #5733), e-mail address. The Register-News, Mt Vernon, IL. The Southern Illinoisan, Carbondale, IL. Obituary of Ruth E. Culpepper, published 6 Aug 2008. Register-News, Mt Vernon, IL, Fri 30 Jan 2004. Annie Culpepper and A. L. C. Stephenson on 3 Apr 1898 in Thomas Co., GA, Book M-544. E-mail written Feb 2006 to Warren Culpepper from Mike Leverette, e-mail address. Emma L. Culpepper and J. A. Parramore on 08 Sep 1898 in Thomas Co., GA.
Benjamin spent 91 days as a private under the command of Colonel Robert Goodwyn in the winter of 1778. He enlisted in the Third Regiment, South Carolina Line, on March 15, 1779, and was captured at the fall of Charleston, SC. November, 1780, he apparently "deserted" his duty as a servant to Captain George Lidell. (Most likely he was captured by the British during this time.) He then served from Jan 1, 1781, to May 31, 1781, 151 days, as a lieutenant under Captain Peter Burns, Colonel Wade Hampton, and General Sumter. Is One stud horse impressed by Lieut. Is 1 ½ ? Flour a 3 7/4………………………………… 2.16..
Is 100 ls of bacon a 6………………………………… 2.10.. Biography* � D.A.R. 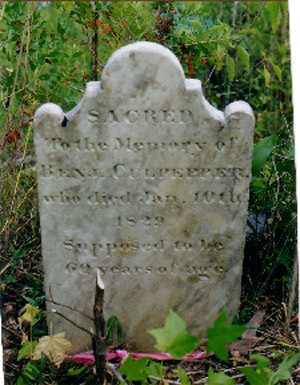 application 169581 indicates that Benjamin Culpepper was born 10 Jan 1750. However, in the 1800 census, he was listed as being between 26 and 45 years of age which would give a birth year range of 1755 - 1774. Since Benjamin fought in the Revolutionary War, that would seem to suggest a birth before 1756. In any event, allowing for a five year margin of error in the 1800 census, Benjamin Culpepper was probably born in the early 1750's in Edgecombe Co., NC. 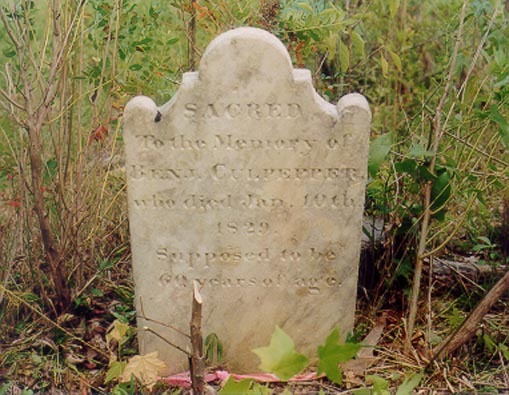 Benjamin Culpepper III probably moved to Camden District, South Carolina in 1767 or earlier, with his brother, Joseph Culpepper, or in 1771 or earlier, with his mother Lydia Culpepper. Benjamin first appears in South Carolina records as a Revolutionary War soldier. According to the "South Carolina Roster of the Revolution" and the South Carolina Auditor General's accounts, Benjamin spent 91 days as a private under the command of Colonel Robert Goodwyn in the winter of 1778. Col. Goodwyn may have been a relative or acquaintance, who, like Benjamin, was from the Sandy Creek area of Granville County, NC (see Granville Grants, by Margaret M. Hofmann). He enlisted in the Third Regiment, South Carolina Line, on March 15, 1779, and was captured at the fall of Charleston, SC, on May 12, 1780. This writer has no record of how long Benjamin may have remained a prisoner of the British. One would presume that prisoners were exchanged fairly quickly after any given battle. He served from Jan 1, 1781, to May 31, 1781, 151 days, as a lieutenant under Captain Peter Burns, Colonel Wade Hampton, and General Sumter. Benjamin probably married his first wife soon after the Revolutionary War. Her name is not known but it is suggestive that Benjamin had land dealings with with a John Monk and a Thomas Monk. Aug 1787, Benjamin leased 50 acres from John Monk, minister of the Gospel, on the north side of the Saluda River. He was also the recipient of three SC state grants that year, one for 265 acres on the south side of the Congaree River; one for 5.5 acres, an island in the Saluda River; and one for 33 acres, two islands in the Saluda River. All were in Orangeburg District. In 1788, Benjamin Culpepper and Thomas Monk were jointly granted 896 acres on Hancock's Branch, in Orangeburg District, some 25 miles or more up the Saluda River from what would become Columbia, SC. Benjamin was listed in the 1790 census in Orangeburg District, SC, living in the Dutch Fork between the Saluda and Broad Rivers, an area where wheat rather than indigo was the normal crop. All of the above mentioned land was in that part of Orangeburg District which became Lexington District in 1804. Sometime between 1795 and 1800, Benjamin married Joyce Powell Sheppard, the widow of William Augustus Strother. William, the son of George Strother, and grandson of Jeremiah Strother of Sandy Creek, Granville Co., NC, had died in 1794, in Edgefield District. He and Joyce had three children, John Sheppard Strother (1788), George James Strother (1791), and Jeanette Strother (1794). At some point, possibly in conjunction with his marriage, Benjamin moved to Edgefield District, SC where he was noted in the 1800 census. Benjamin is also noted in the 1810 census in Edgefield District, SC living near Thomas Richardson and George Strother, both of whom were probably relatives. By December 1811, Benjamin, now about 60 years old, appears to have been in declining health. In order to make "some fixed and permanent arrangement as to his property and estate, and thereby to make provision for his wife Joyce Culpepper, his daughter Joyce Culpepper, and (his wife's son) George Strother," he deeded many of his possessions to George Strother (Edgefield DB 31-69). Perhaps George had agreed to take care of Benjamin and his family, or perhaps this was property which Joyce had brought into the marriage. Included were six negroes, "four of my best and most valuable horses, my wagon and gear, and all of my household and kitchen furniture and all my plantation tools, and one half of my stock of cattle, sheep, and hogs." James Spann and David Richardson were witnesses. In March 1812, Benjamin sold his land in Lexington District to George Strother, in a series of four deeds (Edgefield DB 39-356, 357, 359, 360). Included were three tracts on Hollingsheads Creek on the Broad River, totalling 500 acres, and 20 acres some distance away, near Drehr's Mill on the Saluda River. Strother paid $1150 for the four tracts. The deeds were signed by both Benjamin and Joyce Culpepper. In July 1817, Benjamin sold three tracts of land in Edgefield District, totaling 500 acres, to Jonathan Weaver (Edgefield DB 34-145). Included were 150 acres granted to Robert Lang in 1773, and two tracts granted to David Ravenal Jr., one of 150 acres, the other of 200 acres, on Mine Creek and the Little Saluda River. Joyce Culpepper gave her consent. Benjamin had bought this land in April 1814 (Edgefield DB 31-515). Thanks to Gennie Harris for clarifying to Culpepper Connections and to the NSDAR the husband of Mary Mason. From file "Culpepper, Benjamin Land Grants in SC.doc." Benjamin Culpepper, page 133, 2 M10-16, 1 M16-26, 1 M26-45, 4 F0-10, 1 F10-16, 1 F16-26, 1 F26-45, 8 slaves. Edgefield Deed Bk 22, pp. 12-14. Edgefield Deed Bk 26, p. 190. Edgefield Deed Bk 25, p. 300. Benjamin Culpepper, page 70, 1 M26-45, 1 M45+, 1 F0-10, 1 F45+, 8 slaves. Edgefield Deed Bk 31, p. 481. Edgefield Deed Bk 31, p. 515. Edgefield County Clerk of Court, Deed Book 34, pp. 145-147. Old Edgefield Genealogical Society, quarterly publication: "The Quill," Vol. 31, No. 1, page 8, "Deaths at Red Bank Baptist Church," General Location: Town of Saluda, Benjamin Culpepper, 1829. This date of death is from his tombstone. However, Benjamin's wife Joyce was a Head of Household in the 1820 census, but since there was a Male 45+ also noted, this was probably Benjamin. There is no record of Benjamin in Edgefield County deeds, as far as this writer knows, after 1817. E-mail written Jul 2009 to Genevieve Harris from Mary Ruth Hastie, e-mail address. photos from Mary Ruth Hastie courtesy of Genevieve Harris & Joan Berry.